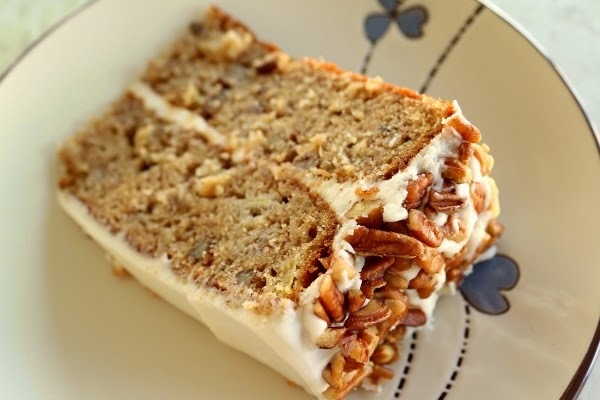 I absolutely love hummingbird cake. The banana, pineapple, cinnamon, walnuts…this is a delectable treat! 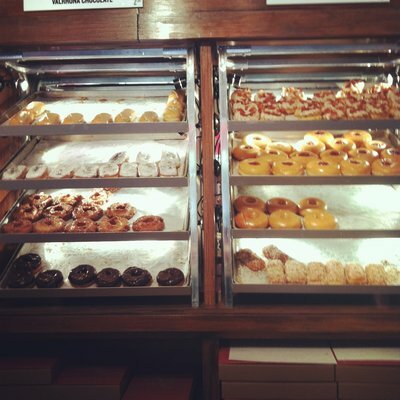 I first fell in love after a visit to my favorite donut shop, Do-rite Donuts. Don’t let the inconspicuous location fool you…if you ask me, they have some of the best donuts in Chicago. And for us vegan folk, they have one vegan option every single day. Can’t beat that! **always check the top left, the vegan option is there! So, after my exposure to their mouthwatering, tasty, vegan hummingbird donut, the search was on! I wanted more! Had to take a crack at this recipe. So, I google’d “hummingbird cake” and found a few vegan cake options. Score! After a little bit of tweaking, I think that I’ve mastered this dessert. Thanks Do-rite! Hope that you enjoy! Preheat oven to 350 degrees F. Spray two – 9 x 2 inch round cake pans. In the bowl, beat the “butter” and cream cheese, on low speed, until very smooth with no lumps. Gradually add the powdered sugar and beat, on low speed, until smooth. Add the vanilla extract. Place one cake, top side down, onto your platter. Spread with about a third of the frosting. Gently place the other cake layer, top of cake facing up, onto the frosting, and spread the rest of the frosting over the top and sides of the cake. Refrigerate cake for a hour for frosting to set. Mariano’s is making a huge stamp here in Chicago. Their grocery stores are popping up all over the city with a huge following. I absolutely love the store… they always have a vast assortment of impeccably fresh produce. And not to forget, their prices are definitely hard to beat. So, when I found out that they now carry vegan cheesecake, I could hardly contain myself, as well-made vegan cheesecake is hard to come by. I was ecstatic. The famous Eli’s Cheesecake came out with a vegan line. Now, they supposedly only sell them at Mariano’s. And it is SO good. Rich. Smooth. Creamy. Delicious. All of the above 😉 As a VeggieLuv‘r, every once in a while, it’s nice to indulge in a very tasty vegan dessert. They currently have a two flavors: Belgian Chocolate and Carrot Cake Cheesecake. Even Travel Channel’s “Bizarre Foods” host Andrew Zimmern describes the cheesecake as “…really good. It has the right texture”. Cheers to that! Also — Check out the Eli’s Cheesecake website for more details! I’ve made these cookies many, many, MANY times. 🙂 They are SO incredibly good. Even my dairy-eating friends can’t tell the difference! Preheat your oven to 350F (177C). In a small bowl whisk together the flax meal and the water. *I buy whole flax, it keeps longer. It can then be ground up in a coffee grinder, or I have my handy, dandy Nutribullet! Allow it to sit for 10 minutes so the mixture thickens. Line a large cookie sheet with parchment paper. In a medium mixing bowl whisk together the all-purpose flour, baking soda, cinnamon and salt until well incorporated. Set aside. In another medium mixing bowl cream the Vegan Butter and sugar until well mixed. Beat in the flax meal mixture from step 1 followed by the brown sugar and vanilla extract. Add the flour mixture from Step 2 and mix until just incorporated. The dough will be thicker than traditional non-vegan cookie dough so don’t be afraid to use your hands to mix it together if you need to. Stir in the chocolate chips. Form the dough into 1 ½ inch balls. Place them on the cookie sheet so they’re spaced about 2 to 3 inches apart. Bake for 15 minutes, rotating the baking sheets halfway through the baking duration. These cookies will not turn golden as they bake so it’s important to pay attention to the baking time. Cookies will store in an air tight container at room temperature for about one week or in a freezer bag in the freezer for up to six months. 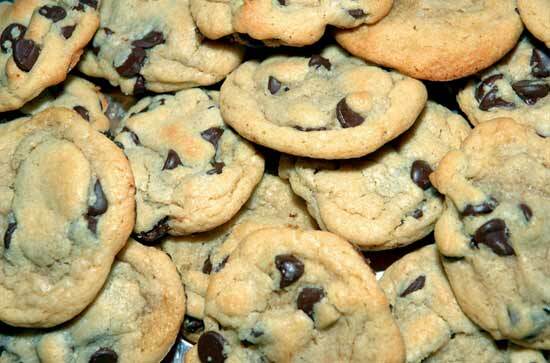 This recipe makes about 22 to 24 Chewy Vegan Chocolate Chip Cookies. Source: http://www.veganbaking.net/cookies/chocolate-chip-cookies#.Uk2B5ha50UU; Hats off to Mattie!